Since my nails are still growing from The Shaping Incident I've decided to use some of the other posts I had sitting on the back-burner so you aren't without content. Hooray backlog! Today we're going to look at one of my ALL TIME FAVOURITE PRODUCTS for nail care. So. You know how there are some products you have been using forever and you can't ever see yourself changing to something different no matter how far in the future you look? That's what this product is for me. 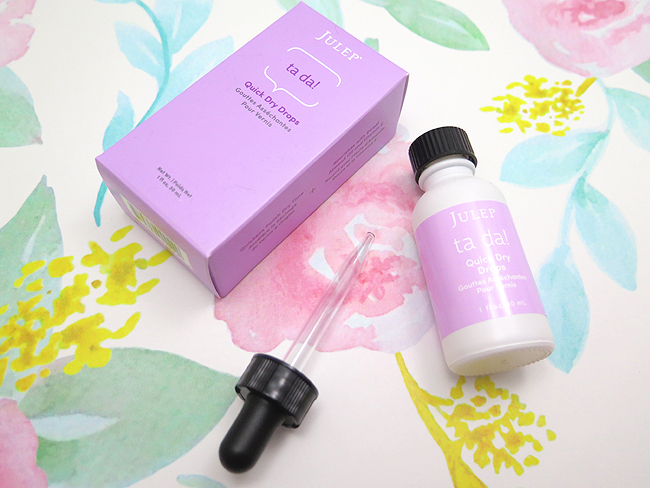 I've been using Julep's Ta Da! Quick Dry Drops since I first discovered what Julep was and I haven't looked back since. They're that good! Want to hear more? Check out the full review below the cut! These drops do double-duty. Not only do they help dry the top layer of your nail polish leaving it smudge-free (legit), they also add oils to your cuticles to help keep them healthy. And they smell amazing! Julep says what I'm smelling is lavender and ylang ylang but what I smell is amazing yumminess. I put two drops per nail, leave it to sit for a minute, and then rub in the excess. They seem to work really well with my skin and nails and I love them! 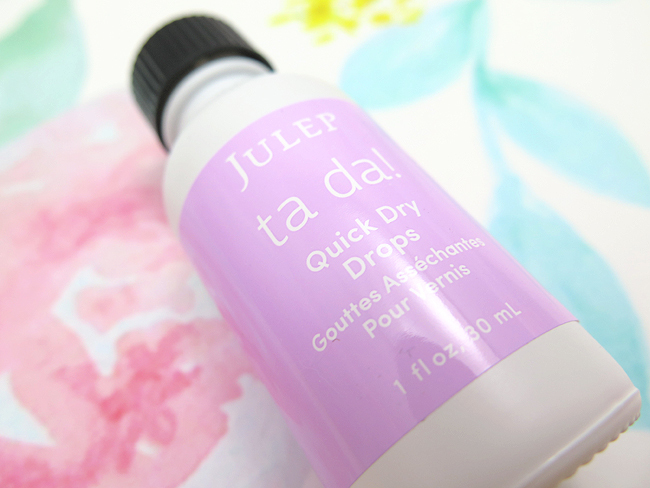 I like how Julep has repackaged their quick dry drops recently. They used to come in a glass bottle with the top just screwed in, and it always looked like it was never quite closed even though it was. Now you get a nice plastic bottle and you can either leave the dropper attached to the bottle or just use it to get the product and then twist the normal cap back on. Much better! I know at least one of my fellow bloggers who is as obsessed with these drops as I am (*cough* Jayne) and if you haven't given them a chance yet you seriously should! I never have less than three bottles in my house hahah. Have you given these drops a try yet? If not do they sound like something you'd like? Let me know! Ohh, I've used these before haha! I was so sad when I bottle ran out, but never got around to buying another one. I'm not sure I'd pay full price for them, but I'll probably add this to my Christmas list! I use Seche Vite so I never really considered drops but I do like that they have oil. Great review. I've never used quick dry drop, but I'm open to them now. Drying drops are pretty much a necessity for me. Love them! I've been subscribed to Julep for a few years now and still haven't tried these. I definitely need to! Drops that I've tried in the past didn't seem to do much, maybe these are better!